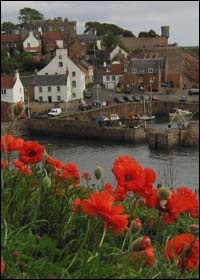 The lovely wee harbor of Crail awaits beyond the dancing red poppies welcoming the wayfarer after a few gentle coastal miles beyond Cellardyke on the Fife Coast path. Have you ever tried out a "kissing" gate, here's your chance, just before you descover those red poppies. Ambushed by a frisky mermaid hiding in her secret lair along little expored caves and coves on the Moray Coast Path just past Portknockie. A little beyond the mermaid's lair is Bow Fiddle Rock. A wonderful natural rock arch which repays inspecting from many angles. When walking from Portknockie to Cullen instead of following the path leading straight across the fields, try angling left along the cliff path to discover fine views of Bow Fiddle Rock. Find the best views of the bow being drawn across the bridge of the fiddle. 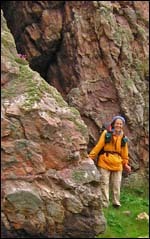 (Page 78 of Speyside Way & Moray Coast Path).